IS once controlled 88,000 sq km (34,000 sq miles) of territory stretching from western Syria to eastern Iraq. It imposed its brutal rule on almost eight million people, generating billions of dollars in revenue from oil, extortion, robbery and kidnapping. Such warnings appeared to persuade Mr Trump not to withdraw all of the 2,000 US troops from Syria, as he had promised in an announcement in December 2018. That plan prompted the resignation of Defence Secretary Jim Mattis and alarmed allies in the Global Coalition to Defeat IS. IS continues to generate revenue through criminal activities. It also receives external donations and is estimated to have between $50m and $300m (£39m-231m) in cash. The SDF has captured about 1,000 foreign IS fighters. 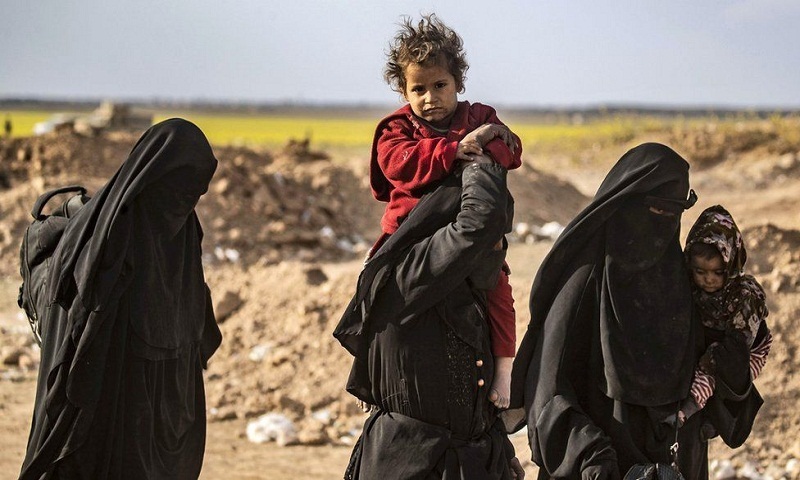 Hundreds of women and more than 2,500 children associated with foreign fighters are meanwhile living in camps for displaced people in SDF-controlled areas. There are also reported to be about 1,000 foreign fighters in detention in Iraq. IS grew out of al-Qaeda in Iraq, which was formed by Sunni Arab militants after the US-led invasion in 2003 and became a major force in the insurgency there. In 2011, the group - now known as Islamic State in Iraq (ISI) - joined the rebellion against President Bashar al-Assad in Syria, where it found a safe haven and easy access to weapons. At the same time, it took advantage of the withdrawal of US troops from Iraq, as well as widespread Sunni anger at the sectarian policies of the country's Shia-led government. In 2013, ISI began seizing control of territory in Syria and changed its name to Islamic State in Iraq and the Levant (Isis or Isil). The following year, Isis overran large swathes of northern and western Iraq, proclaimed the creation of a "caliphate", and became known as "Islamic State". A subsequent advance into areas controlled by Iraq's Kurdish minority, and the killing or enslaving of thousands of members of the Yazidi religious group, prompted a US-led multinational coalition to begin air strikes on IS positions in Iraq in August 2014. The battle to push IS out of Iraq and Syria has been bloody, with thousands of lives lost and millions of people forced to flee their homes. In Syria, troops loyal to President Assad have battled the jihadist group with the help of Russian air strikes and Iran-backed militiamen. The US-led coalition has meanwhile supported the SDF, an alliance of Syrian Kurdish and Arab fighters, and some Syrian Arab rebel factions in the southern desert. In Iraq, local security forces have been backed by both the US-led coalition and a paramilitary force dominated by Iran-backed militias, the Popular Mobilisation. The US-led coalition, which included forces from Australia, Bahrain, France, Jordan, the Netherlands, Saudi Arabia, Turkey, United Arab Emirates and the UK, began launching air strikes against IS targets in Iraq in August 2014. The coalition's Syrian air campaign began a month later. Since then aircraft deployed as part of the coalition's Operation Inherent Resolve have carried out more than 33,000 air strikes. Russia is not part of the coalition, but its jets began air strikes against what it called "terrorists" in Syria in September 2015 to bolster the government of President Assad. The Russian defence ministry reported in August 2018 that its forces had flown 39,000 sorties in Syria since 2015, destroying 121,000 "terrorist targets" and killing more than 5,200 members of IS. Early progress in the US-led coalition's campaign against IS included the recapture of the city of Ramadi, the capital of Anbar province in Iraq, by Iraqi pro-government forces in December 2015. The recapture of Iraq's second city of Mosul in July 2017 was seen as a major breakthrough for the coalition, but the 10-month battle left thousands of civilians dead, with more than 800,000 others forced to flee their homes. In October 2017, the Syrian city of Raqqa, so-called capital of the self-styled "caliphate", was re-taken by the SDF with coalition air support, ending three years of rule by IS. The following month, the Syrian army regained full control of the eastern city of Deir al-Zour, and Iraqi forces retook the key border town of al-Qaim. Exact numbers of the casualties for the war against IS are not available. The Syrian Observatory for Human Rights, a UK-based monitoring group, has documented the deaths of 371,000 people, including 112,600 civilians, in Syria since the civil war began in 2011. The UN says at least 30,912 civilians were killed in acts of terrorism, violence and armed conflict in Iraq between 2014 and 2018. But Iraq Body Count, an organisation run by academics and peace activists, puts the civilian death toll at more than 70,000. At least 6.6 million Syrians have been internally displaced, while another 5.6 million have fled abroad - more than 3.5 million of them have sought refuge in Turkey, and almost one million in Lebanon and almost 700,000 in Jordan. Many Syrians have sought asylum in Europe, with Germany taking the greatest number. In Iraq, the number of displaced people has fallen below two million for the first time since December 2013. By September 2018 the International Organization for Migration (IOM) estimated nearly four million people had returned home. But the UN reports that a lack of jobs and destruction of property and limited access to services are still preventing many people from returning to their homes.